When I was in the first grade, I realized to my dismay that the name Jennifer was not the most original when there were five of us in the same class. Jenny P, Jenny R, and the list went on until I was deemed Jenny J, which I ended up shortening to Jen in high school to separate from the pack. While the popularity in the 70’s and 80’s of parents naming their daughters Jennifer wore off—now we’re in a sea of girls named Madison—the camaraderie between us still exists as I just discovered a large amount of Jennifers, even including the professor in my current graduate school course. While the plethora of Jen, Jenny, and Jennifers (with a wide variety of spellings) is a minor annoyance, there’s a diverse enough group of women with the name that spans several cultures, races and backgrounds to keep things interesting. “Does any other name scream generic Asian girl more than Grace Lee?” director Lee asks and after a consultation with a private investigator turned up far too many Graces in her home state of California, the director had an epiphany for tracking down savvy women who share the same name and created a website (gracelee.net) that soon was flooded with registrants who not only shared the same name, but after taking part in her survey, began realizing they had several characteristics in common. 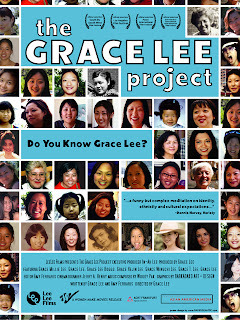 Filmmaker Lee’s survey resulted in an intriguing composite of the average Grace Lee who is described as roughly twenty-five years old, living in California, and typically the American daughter of Korean immigrants, who stands about five feet and three inches tall, holding an advanced college degree (typically a Master’s) after growing up with an average of three and a half years of piano lessons with 40% of Lees being named for religious or Christian reasons and some others who share their parent’s fondness for movie star turned princess Grace Kelly. Not wanting these Grace Lees to be interchangeable, director Grace Lee journeyed to various states and countries (including a fascinating trip to Korea where the name reigns supreme for women, businesses, and much more) to encounter a few highly memorable Grace Lees. Not only is Grace Lee the name of Bruce Lee’s mother and one given to a large number of P.K.’s (which the director explains stands for Pastor’s Kids), but it’s also the stage name of a cruise ship singer, and a brainy and beautiful TV newswoman in Hawaii who shares that her name is so common that she felt a need to make an impression in order to stand out since she notes that she won’t be remembered for her name alone. We also meet one of several young Asian girls who feel they’re under enormous pressure to be perfect and excel in their academic pursuits (both due to parental and cultural pressure but also, the filmmaker realizes Asian stereotype) and hear of one in particular doing something atypical of a Grace Lee which is attempting to burn down her San Francisco school purportedly due to the fact that she was embarrassed by her scholastic performance. However, as the director notes with equal parts admiration and annoyance, even when Grace Lee is committing arson she’s still described by others as a nice, smart and quiet Chinese girl. Although some critics may call the film a vanity project, I found it to be an alternately funny and informative documentary and I was amazed by the inclusion of a few stories that I know will stay with me long after the film ended when we meet two heroic and inspiring Grace Lees including one who became an integral part of the black civil rights movement in Detroit and another who went into hiding with her best friend and their children to escape the friend’s abusive husband. While Grace Lee the name is popular and recurring, Grace Lee the person in each and every case the director included is original and unique—valuable and once it’s over, one realizes (as I did with the name Jennifer) how much of an honor it would be to have been given the name of Grace Lee.